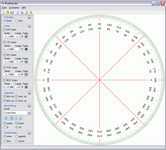 Protractor - construct your own protractor with the program "Protractor"
With the program "Protractor" you are constructing protractors to your own will. The subdivision is possible in Degrees and Grad. The color display, labeling, and orientation can be adjusted within wide ranges. The stroke lengths are determined as a percentage of the radius. This gap with the strokes of the font is automatically postponed. In the Print dialog, you specify how many protractors printing on one page. Furthermore, here set the position of the center and the radius of each protractor. You can for example printing CD labels and then glued them on a CD no longer required. This allows, among other things continue to use promotional CD's. Here you can check before printing, if all are properly aligned to print protractors. Here you can see whether they overlap or are no longer in print area. The program runs under Windows 98SE, Windows 2000 or Windows XP.